When I looked at the biggest problem facing Keith Ellison according to the KSTP/SurveyUSA poll, it was easy getting caught up with the 41%-41% ‘horserace’ figure. That a candidate with virtually no name recognition is tied with a candidate with virtually universal name recognition isn’t exactly commonplace. That isn’t what caught my attention most, though. 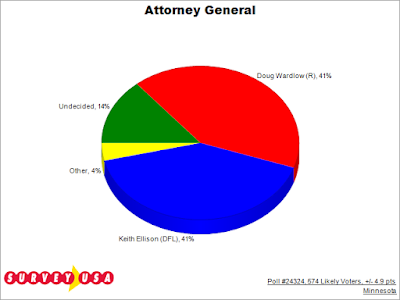 Q4 of the KSTP/SurveyUSA poll asks “Minnesota will also elect an Attorney General. If the election for Attorney General were today, and you were filling out your ballot right now, who would you vote for? (candidate names rotated) “, the poll found that 43% of independents said that they’d vote for Wardlow but just 27% said that they’d vote for Ellison. What’s even more striking is the fact that Ellison finished third, behind Wardlow 43% and Undecided at 27%. It’s also worth noting that 14% of all voters are undecideds. It isn’t a stretch to think that those voters won’t break for Ellison considering the fact that he’s such a known commodity. This isn’t real, is it? 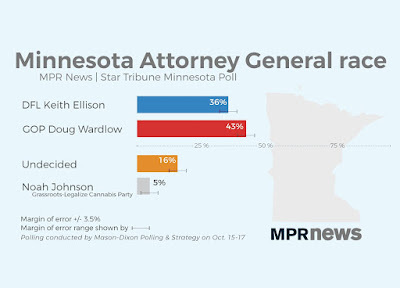 When he jumped into the AG’s race, most Minnesota pundits thought it was Ellison’s to lose. If he loses, it’ll be the end of Ellison’s political career. How do you overcome a setback like that? It’s one thing to win over former Republicans. IT’s quite another to win back #MeToo Democrats. The only thing missing from the headline is the theme song from the Twilight Zone. The political tide is turning. It’s unmistakable. It isn’t that Democrats can’t get their message out, which is their cop-out explanation for why they fell short of their goals. It’s that they’ve become the lecturing party or the ideological party rather than being the listening party or the solutions party. Speaking of messaging, the Republicans’ message has consisted of telling people about the strengthening economy, fatter paychecks and greater financial security. The Democrats’ message, compliments of Ms. Pelosi, has sounded like fingernails across a chalkboard. Keith Ellison, the deputy chairman of the Democratic National Committee, was handed the Grim Reaper baton when he said this to the Progressive National Candidate Training gathering last week: “Women are dying because we are losing elections,” Mr. Ellison said, Fox News Insider reported. “We don’t have the right to lose a damn election. We have to win.” Mr. Ellison was referring to a reported rise in maternal mortality rates in Missouri and Texas. The good news is, for Texas, that report has already been disproven, and explained by a computer reporting error. And what is their argument really based on? The infantilizing of women. Underscoring Mr. Ellison’s remarks is an argument that women are so fragile, so vulnerable, that if Democrats don’t win and government doesn’t control more of your life, you’ll die. That is an inherently sexist argument, promoting the fraud that women can’t control their own lives and need a Big Brother to help them along. Back in January, I wrote this post, which I titled “2018: No wave, barely a ripple?” At the time, I wasn’t sure if the trend towards Republicans would continue. If I wrote that article today, I’d omit the question mark from the title. The blue wave propaganda is coming from people like Chris Cillizza and other mindless lefties. The polling is clear. Nobody thinks that the improving economy and fat bonuses isn’t changing the mindset of the American people. The DC/NY worrywarts should take a valium. The Trump/GOP tax cuts virtually sell themselves. Republicans still have to get out the vote but the policy sells itself. There’s a lesson I learned from a small business near my house. It’s legendary, actually. It’s called Val’s Rapidserv. They’ve been in business for 50+ years. I might be wrong on this but I don’t remember ever hearing a radio ad for them, most likely because their word-of-mouth advertising is exceptional. This morning, I spoke with a person who owned a business right by Val’s. This entrepreneur told me that they “piggyback off of Val’s”, telling callers that they’re right next to Val’s. The point is this: Val’s has 100% name recognition and the best fries in Minnesota. This translates to politics. If you’ve got a great reputation and a fantastic product to sell, you’ll win if you work hard. That’s where Republicans are at right now. President Trump hasn’t been bashful in calling Nancy Pelosi the “Republicans’ secret weapon” in the 2018 election. Perhaps the President needs to rethink that opinion. It isn’t that Pelosi has quickly gotten popular. She’s still as unpopular as ants at a picnic. It’s that Chuck Schumer’s popularity has taken a significant dip recently. Sen. Schumer is a major drag on battleground state Democrats. How many Democrat senators he’ll hurt remains to be seen but his decisions have already contributed to the Democrats’ vulnerable situation going into 2018. The #SchumerShutdown hurt immensely. 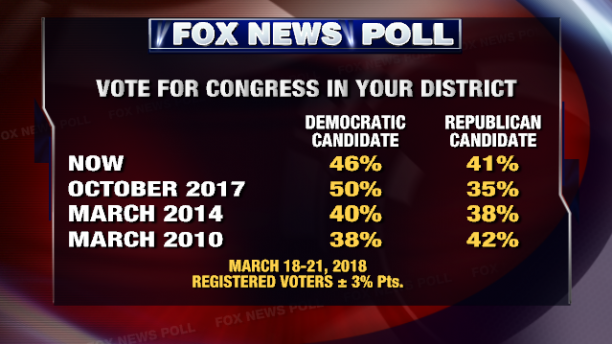 The only thing that’s hurt Democrats more was unanimously rejecting the Trump/GOP tax cuts. As a result, Democrats should consider a net loss of less than 5 seats in the Senate a moral victory. On Pg. 51 of the amendment, we learn that $1,571,000,000,000 is appropriated to build President Trump’s wall in 2018. Further, $2,500,000,000,000 is available to be appropriated in each year starting in 2019 and going through 2027. Further, the legislative language states that “the amount specified in subsection (d) for each of fiscal years 2019-2027 shall not be available for such fiscal year unless (A) the Secretary submits to Congress, not later than 60 days before the start of such fiscal year a report setting forth a description of every planned expenditure…, (B) a description of the total number of miles of security fencing… etc. The money isn’t appropriated all at once, meaning that future congresses can stop the building of the wall. Don’t think President Trump won’t campaign against red state Democrats on that issue this fall. I’d bet the proverbial ranch that will be a major thorn in the Democrats’ sides. Just $1,571,000,000 is appropriated to build the wall. The rest of the money is promised but not appropriated. Sound familiar? 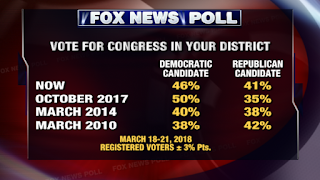 Democrats are playing a risky game. Don’t bet on it turning out well for them this fall.